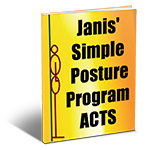 Sign up today and also receive Janis’ weekly newsletter with healthy tips, yummy healthy recipes and more! Your privacy is assured. We will not sell, rent or share your information with anyone.